My language loving middle schooler lately has been seeking out anything with Latin or Greek root words to study. 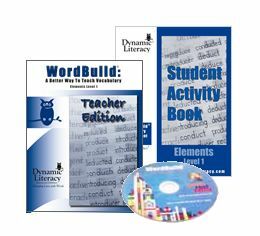 Reviewing the WordBuild: Elements, Level 1 set from Dynamic Literacy was like a dream come true for her. For the purpose of the review, we were given the WordBuild: Elements, Level 1 student and teacher physical books, along with the CD for WordBuild the Game. Both the teacher and student books are textbook sized with softback covers. The student book is consumable and more like a workbook in that it has some information, but the majority of it is exercises for the student to complete. This WordBuild Elements, Level 1 curriculum is designed for 6th to 10th graders (7th to 12th grade for remedial work) to learn words frequently used Latin and Greek roots. While there are brief daily assignments, it is definitely not an independent work style set. The teacher's guide gives the instructor an almost scripted lesson for each day, however no single lesson should take over 15 minutes. The teacher's guide actually gives recommended lengths of time to work on each portion of a lesson. The idea behind WordBuild is to help students learn the core roots, prefixes and suffixes used in the English language to result in learning more than 16,000 words without memorization. Students will discover how words work and learn to decipher the pieces of meaning (morphemes) in words. The teacher's guide starts by explaining how the entire system should work and what the purpose of each type of lesson will be. Each day of the week, except for the Advance Preparation lessons, is structured similarly. The students will study one single root for an entire week, or five lessons. For each lesson the teacher's guide lists the objectives, how to differentiate the instruction (provided easier or more difficult activities), and materials needed. Then the guide goes into the scripted part of the lesson that helps the teacher use discussion to bring the student to the meaning of the words. Instead of simply telling students how things work, discussion allows the student to discover on their own. A quick assignment of a game or puzzle is given each day as well. The student is given very limited time to complete their independent portion before the answers are discussed. The teacher's guide does contain answers for all the assignments, but often times these are not needed. The final lesson for each root is called a Check-Up, but really it is a quiz to be copied out of the teacher's guide. Answers for the Check-Ups are provided in the appendix and not in the regular lessons. Additionally, the teacher's guide appendix includes a midterm and final assessment along with the answers. Besides the regular lessons, there are also Advance Preparation lessons that review and teach specific prefixes and suffixes to be used in the upcoming lesson. It is important, especially if your student has not used an earlier WordBuild level, to cover these Advance Preparation lessons. Each lesson of this type takes 1-5 minutes, so several could be done in one day. Towards the beginning of the curriculum there are quite a few Advance Preparation lessons before studying each new root. However, a few weeks in and those prefix and suffix lessons are greatly reduced because the majority have already been covered. The student book is significantly smaller than the teacher's guide since it really only contains the activities to be worked. While the teacher's guide has root, suffix, prefix, and word definitions in the appendices, the student book has prefix and suffix meanings on the inner front and back covers. She even was able to take her WordBuild on the go! Samples of the magic square activity and prefix practice. After spending some time going over the teacher's edition, we started out on a Monday working on the first set of Advance Preparation lessons. The workbook portion of these are in the back of the student book, while they are inline as needed in the teacher's guide. There are quite a few Advance Preparation lessons prior to the first root lesson which would take several days to complete at only 15 minutes per day. So, right off the bat we broke their "15 minutes per day" rule and completed all of the prefix and suffix review lessons in one day. On day two of our use we started with the lesson for the root "form." Amber found the lesson portion interesting and loved the root squares activity, but wanted to spend more than her allotted five minutes creating words and defining them based on her knowledge of the morphemes. I decided that if my child really liked these activities, I wasn't going to hold her to the 15 minute rule. Still it's good to know that the lessons are not designed to go over 15 minutes. The day three lesson using the magic squares confused Amber every single week. I'm not sure why, but she had problems with this one. She understands the concept of a magic square and knows how to match definitions to works, but still these activities were her least favorite. We continued working the lessons and brief activities every day until the fifth day when she should have taken the quiz, but since we don't test in our homeschool that lesson was skipped each week. Amber also completed the Word Wall page for each root, but we did not hang a Word Wall in our school area. Using WordBuild the Game, and a sample of the Stair Steps activity. The final fun piece to this set is WordBuild the Game which runs on a Windows PC or Mac. We only have Windows 7 computers in our house and installed it on Amber's computer for her to use. The game lets you create words using morphemes learned in the curriculum and the user is awarded points for the number of morphemes used per word. After selecting a root family, you are taken to a screen with suffixes and prefixes to add to the main roots in the family. Each root, suffix, and prefix selected are shown with the definitions. Once you finish building a word you click the "Check It" button to verify the word created. If it is an existing English word, the definition will also be displayed. Amber spent hours playing this game and trying to make up words and see if they existed. We definitely liked the systematic approach of learning vocabulary used in this set and were impressed that it includes both Latin and Greek morphemes. But most importantly, the lessons are kept short and fun while guiding the student to make their own word discoveries. Please check out what other members of the Review Crew thought of the various Dynamic Literacy products.